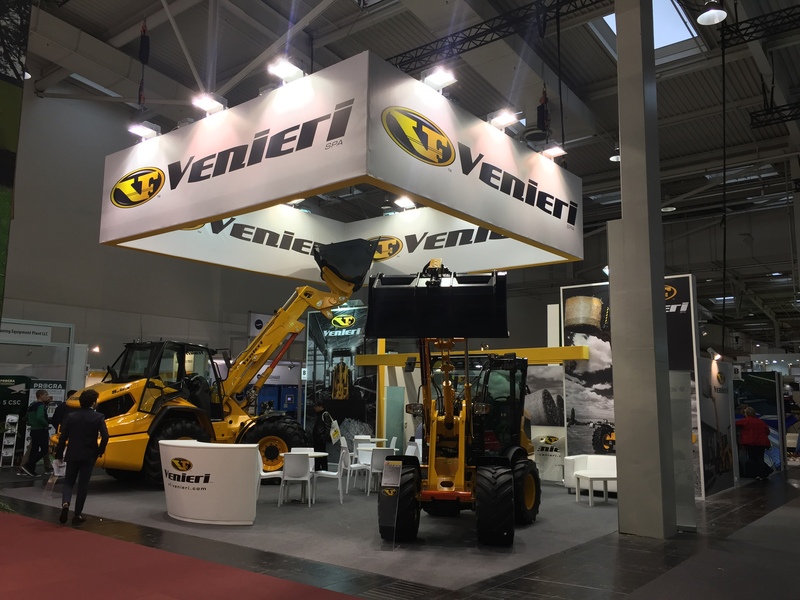 VF-Venieri participates for the first time in Agritecnica, the most important agricultural mechanization fair in the world, in the 2017 edition.The two machines in the booth are the compact articulated wheel loader 1.63C “Venierina” and the articulated telescopic wheel loader 8.63 TL. Two novelties that enable VF-Venieri to present themselves at the German fair with products that clearly point to evolved the logistics of contemporary farms. The market for compact and telescopic wheel loaders is in fact strategic for agriculture with a strong impact, above all, on North and Central Europe. With these two models, which integrate a range today comprised of 16 wheel loaders with operating weights from 3,600 to 22,000 kg and with buckets from 0,4 to 3,5 mc, as well as 3 multi-purpose articulated backhoe loaders from 8,500 to 10,000 kg weight operational and two multi-purpose rigid backhoe loaders of 4,000 and 9,400 kg, VF-Venieri proposes to farmers an offer to cover all business needs. VF-Venieri’s smallest articulated wheel loader is on the international standstill with remarkable performances. An entirely new design that prides practicality, visibility and operational dynamism. With the VZKP kinematism, the new VF 1.63 C allows you to have high tear forces while maintaining the perfect parallelism when using forks and all types of equipment. The operating weight of 3,600 kg with a breaking force of 3,840 kg, a static load of 2,300 kg with the line frame and a maximum steering angle (45 °) of 1,850 kg makes it possible to understand the potential of this compact wheel loader of VF-Venieri. The availability of three different cabs, standard headlamps and front and rear hydraulic output clearly indicates how the VF 1.63C is a compact wheel loader with high-performance and operational features. The possibility of use with any kind of equipment allows to increase versatility, meeting the needs of both logistics and service on farms: handling and transportation, but also cleaning, maintenance work, and animal feed assistance. The only limit is given by the business needs. The VF 1.63 C fits into a dynamic and competitive market that sees the compact wheel loader market growing rapidly thanks to the spread of a multi-purpose machine, concept that is the true soul of this wheel loader. An operating weight of 8,200 kg, a maximum height with forks of 5,255 mm, a maximum load of 3,200 kg. Here are the key figures of the new VF 8.63 TL, the first telescopic rubberized articulated dumper of the Italian builder who comes to Agritechnica with a fundamental product for the logistics of farms and livestocks. A fundamental turning point that allows the Italian brand to enter the agriculture market going to integrate its offer with a very interesting machine. For the first time VF-Venieri does not use the high pressure hydrostatic transmission on its wheel loaders, but the Venieri Electronic Power-shift (VEPS). The presence of well 6 gears forward and 3 gears rear to fully electronic management allows you to have traction control a traction control suitable for farmers and similar to a classic tractor, A clear strategic choice to meet the agricultural market and to have a ground-breaking power that is appropriate to the most difficult jobs. In addition to a significant reduction in consumption in the classic load & carry uses typical of biogas production plants, livestock farms, logging of hay and stable. For the engines, the partnership with Deutz is confirmed thanks to the TCD 3.6 which, with its 3.6 liter split in 4 cylinders, has a power output of 100 kW (136 hp) at 2,200 rpm. The electronic optimization of torque and power curves allows for a significant reduction in fuel consumption. The engine conforms to Stage IV using the EGR, DOC and SCR. The hydraulic system follows the VF-Venieri philosophy of robustness, dynamism and controllability. The maximum capacity of 140 l / min is delivered by a gear pump that serves a Load Sensing distributor: it maintains controllability and simultaneous movements without losing the fundamental brilliance needed in agricultural applications. The cockpit, with the general design, gives you maximum visibility without compromising on comfort with a car concept. ROPS and FOPS approved, has an internal volume of the largest in the category without increasing total external dimensions. It is a telescopic wheel loader that plays a key role in the development of the VF-Venieri range and the presence of the agricultural market of the Italian manufacturer, which, more and more, emphasizes its vocation to this type of application.